ShotList places an essential, professional-quality filmmaking tool in the hands of anyone putting together a scripted movie or video shoot, at an affordable price. ShotList stores the details, locations and notes for each scene ready for instant recall. Use it to track progress throughout the day of a shoot, or to break down a script and plan out a multi-day shoot in advance – all “on the go”. If inspiration strikes, or a last-minute disaster forces a rethink, you always have the latest version of your schedule right there with you and can change plans on the spot, and let others know about it. Plan shooting schedules for scripted drama, commercial shoots, radio production or motion capture. Add, edit, delete or re-order your scenes freely across multiple shooting days. Never miss a vital scene by tracking progress as you shoot, marking each scene as “To Do”, “Delay”, “Cut” or “Done”. View and store shot details. Store many storyboard images (or location, or continuity images) for each scene. Notes, and details (such as shot type and camera angle) can be stored for each shot. Mark each shot as it is completed. 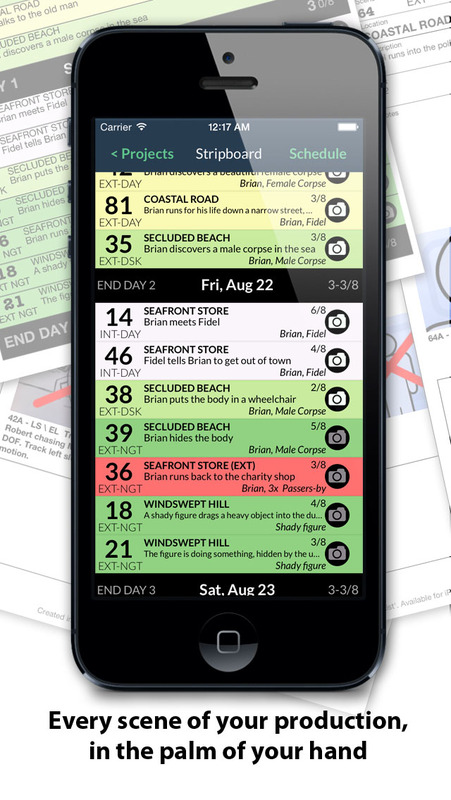 Store comprehensive notes for each scene, including one-tap access to phone numbers, or web addresses (such as location information, or train or tide timetables). Keep everyone informed of last-minute changes by emailing them the latest “one-line schedule”, or a full PDF. Print out update sheets directly from the app, or exchange updates with other ShotList users on your team with Dropbox. You can discover more about what ShotList can do from our User Guide. ShotList works with all iPhones (including iPhoneX) and iPads, iPad Pro and iPad Mini, and iPod Touch running iOS9.0 and above, and is available now on the App Store. Cool! Congrats! Bring on the iPad edition! Thanks Mark. ShotList is already a Universal app which supports both iPhone and iPad in full-screen resolutions. Is there an export option? Or PDF? How do I get the info on paper? I don’t want to be the only one with the info on set. This is the only thing stopping me from buying it. Very cool! see https://solubleapps.com/shotlist-guide-7-oneline/ for full details on the “oneline schedule” feature. You can also share, or collaborate on, your project files wirelessly with other members of your team who have ShotList, using the free Dropbox service. Right, but what about just printing out the grid, all nicely formatted? Sending the email strips the formatting. It would be super impressive if I could print the grid with all the colors and notes to share on set the day of the shoot. Technology is great, but i need to have it on paper in the end. I’m also not going to hand my editor my iPad for all the notes, or expect that he will have one (or that there will be wifi Internet in the edit suite). See what I mean? Yes, Its certainly something we plan to enhance with an update. We are keeping a close eye on the Airprint technology to see how that develops, but I am not sure it has the take-up yet. There are print-server solutions for supporting it on non-HP printers, but that’s a bit techie for many people. You also now can print directly from the app via AirPrint. Hi there, I have been hoping for years now that someone come up with a program for directors who want to mark up there script showing coverage of there shotlist (linked to the shotlist as well).. I still do it by hand.. have tried annotation apps but adapting them to this very specific task is inpractical.. Ideally an app would work with a script in final draft so you could contrinue with your revisions without having start marking up a new script. pleasxe someone write it!! I am sure you will have many greatful customers from newbies to household names. Any chance there will be an Android version down the road? Its not planned for Android at the moment I am afraid, but we are certainly considering it for the future. Wow, this is exactly the app I would have commissioned…. Is there likely to be a companion application for the Mac? It would probably be less unwieldy to break down a feature screenplay on the computer before sharing data with the iPhone or iPad for on-set reference and updating as shoot days progress. Also, do you foresee adding the ability to import breakdowns from FD Tagger or MM Screenwriter? Is there currently any way of extracting DOOD information? Having the live data exclusively available on the iPhone/iPad limits utility in locations where wifi access is problematic. We are planning to add a Day Out Of Days report in an update. UPDATE: The Character sheet in the print or PDF report now tells you which days each actor is required for. We don’t plan to write a separate companion app, but we are considering adding the facility to import the data from a spreadsheet for people who would like to use that method. We will look into this. Import from Final Draft and other applications such as EP (if the file formats are readable) is on our list of possible optional plug-in modules for ShotList. Which of these we support will depend on demand, so let us know (by email please), but note that we are focusing on enhancing and expanding our core feature set first, which all our users will benefit from. This looks to be a fantastic app. I have to admit, however, that at the current price point, I’m sure that many are a bit nervous to try it out. Any thoughts on a lite version that people can take for a test drive? Also, I’d VERY much like to see an export feature to popular spread sheet formats. On my productions, we use excel as our primary means to track shots and it’s a bit unfeasable to expect everyone to own an iOS device and/or a copy of this software. The email feature is a fantastic start, but it’s use is very limited and unwieldly considering it’s just plain text. Our experience with other apps on the store has been that the problem with releasing cut-down versions is that people tend not to read the description fully, and then mark you down for not providing the full features they need (this happened to us on our MailShot group email app sometimes, even when that cut-down version was free!). We may reconsider this at some point in the coming months, thanks for the suggestion. We have had a few requests for spreadsheet export and import, and that is something we are looking at adding within the next couple of months in one of our free updates. We have reduced the price of the full version considerably since this email was originally written. What about internationalization. I’m thinking of the german in particular!? Not at the moment, but this may be something we do later on. When I do internationalise it will probably be to “EFIGS” (English, French, Italian, German and Spanish). I really like the storyboard feature. Any chance of getting more than six per scene? Thanks. We don’t plan to increase this at the moment, mainly for screen-space reasons (especially on iPhone) though in our last update we added duplicating scenes to ShotList- so at a pinch you could have a B version of your scene, with 6 more frames in the B version for when you needed more? If other people would like this feature expanded please let us know by email or in the comments and we will certainly see what we can do. We are listening and love feedback, and this is the first request we’ve had for this. How many frames would you use for a scene a) typically, and b) as a maximum? Very nice app. Really really could do with a PDF output option though. You can now email the project as a PDF, or print directly from the app via Airprint. Feels like a really nice app and seriously considering it. Does it come with a feature for designing floor plans? ShotList is not intended to design floor plans, although you could easily use our storyboards feature to store other images, such as floor plans and/or a blocking diagram for the scene (created in another app, or photographed from a sketch using the inbuilt camera) along with location photos and your notes for the scene. You can store 6 images per “strip”, which is usually a single scene although some people who would like more detail use one strip for each shot, then they can store six images and individual notes for each shot. Just to verify: there is no corresponding desktop app to enter info. All entry work must be done through the iPhone and iPad, correct? If a new scene is added/deleted, are all following scene # numbers updated to reflect the change? As most productions need everyone to mean the same thing when they talk about “scene 26”, it does not renumber, as you normally wouldn’t want this to happen. TIP You can use letters in scene names, so you could insert scene 26A between 26 and 27 if you wanted to indicate the order of a new scene. I am having trouble with the Dropbox feature. I keep getting “Can’t create folder in Dropbox.” Any suggestions? My folder is empty and the connection is correct. This message is displayed when the DropBox routine to create a folder reports a problem. The folder is given the same name as your project, please check there is not already a folder with that name, and that your project name is a “legal” name for a folder (try renaming it to something simpler?). I have seen this happen when quote marks were placed in a project name, for example. You could perhaps also see this if your folders are nested very deeply, or have VERY long names. Any chance of adding an integrated clapper state. The feature could prefill all the info including takes as it could track the history. This would allow me to do what I need in one app. Hi Paul, thanks for your input. Thanks for your comments Michael, you have fantastic timing! We have just spent the last week or two adding a PDF export for stripboard and details pages, and the ability to print them direct from iPad and iPhone. I hope you find this feature useful when it is released in the next version. In scanning you comments page and the information for the app itself, I have missed where I can create my files on a computer and then transfer to either iPhone or iPad. Knowing this would definitely help in my decision to buy. Hi Dave, You can find the answer here on our support page https://solubleapps.com/shotlist-support/#IMPORT. Thanks for your kind comments, and for your enquiry. The next update will add the ability to send a PDF of the stripboard and/or details pages, and to print them from your device. We are looking at import and export from XLS at the moment, to allow edit and adding scenes from PC or Mac. Please drop us a line to our support email to let us know what you are looking for for cast and crew. UPDATE You can now send a PDF containing the stripboard, individual scenes and storyboards. UPDATE You can now export and import from XLS, to allow scene editing from a spreadsheet on a desktop. Thank you for your quick response! Very nice to see that you really care about your customers. The thing I really miss during shootng is the possibility to add other data. Now I have to leave your app and switch to another app just to read my callsheet, crewlist or rental-list. For example; I want to add a callsheet or a crewlist. This can be done in the beginscreen, but can also be a feature in the project so that I can import text (doc or pdf) in the ‘notes’ section, or perhaps copy/paste it. Another thing is that I would like to add a time to my scenes, so I can see if I’m behind schedule or not. Other features could be weather and locationmaps. The xls import, pdf-export, print-option and adding scenes in the next update sounds super! I still enjoy using your app. Yeah, location maps via Google Maps would be nice. either, Google Maps link in “location section” or even graphical Google Map directly in Shotlist app. Apple advise developers to keep mobile apps small and focused, rather than trying to replicate everything a desktop program does. Filmmakers all have different working methods, and tend to request different features from each other, this is why we left a large notes field for example, as we thought people would have lots of different uses for it. If the demand is there , we may experiment with in-app add-ons for Shotlist at a reasonable cost each. This is a more likely strategy than jumping to a separate ShotList 2 app, or raising the initial purchase price, as people expect low initial prices on the app store even for a niche app such as this which could never equal the sales figures of more general purpose apps. The Airprint support and PDF export will be free additions in the next update, and small improvements will remain free. Examples of the sort of extras we may charge for might be a clapperboard that can take input from the details page, XLS import and export (this has a cost to us as we need to buy in a licence for it) or map integration. Is it possible to import shooting schedule into the ShotList app? I have 90+ scenes that is pretty time consuming to type on an iPhone screen.. The next version of Shotlist (available as a free update) will add the ability to export and import in .xls format, so you can cut and paste data on a PC or Mac spreadsheet format. We will be submitting it to Apple in the next few weeks. Hi! I got this nice the app but i’m stuck with my first scene and i don’t know how to add another one! Help me pleade. A big hug from Chile! No problem. On the list of scenes, tap “manage” in the top menu bar, then tap “+” on whichever type of strip you want to add (either a scene, or a day marker). To get the most out of Shotlist, you will probably find the User Guide very useful. There are links to it at the top of the support page, and on the black menu bar of our website. If you get stuck, just drop us an email. We’re always happy to help. We are many users, thanks! This app is great. It would be perfect if it had a feature to record each TAKE of a shot. Say you’re on the shot edit page, tap a TAKE button which adds a TAKE page. This page stores a list of each take for that shot. Each take can be labeled: good, bad or usable. This would be great so the editor knows which TAKE to focus on and not waste time going through all the takes. Thanks for the suggestion Steve, and for your kind comment. We’ll look into how we might tackle this as part of a future update.